What do you get when you put a corporate attorney and mix in a personal finance writer for good measure? A lot of financial goodness in one episode! Stop what you are doing, press play and learn about Valerie Rind! Want to continue the conversation of the podcast? [00:00:08] ANNOUNCER: Welcome to the Her Money Matters Podcast, the podcast to help you take control of your finances. 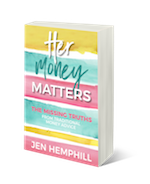 Join your host, motivational money coach, Jen Hemphill, as she shares with you practical, simple money insights and real life stories by women like you. [0:00:26] JH: Hey there, welcome back to the Her Money Matters Podcast or if you’re tuning in for the first time, I appreciate you taking some time, picking this podcast out of all the hundreds and thousands of podcast that there are out there for you to listen to. I’ve got a fantastic guest for you today but before I share more about her, I wanted to make sure to remind you that we have a community. A free community over on Facebook, the Her Money Matters Community. 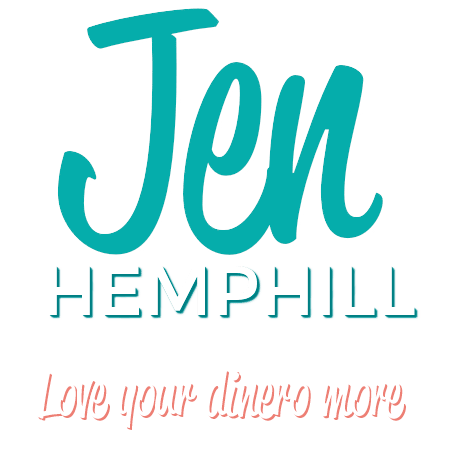 And you can join by simply going to Jenhemphill.com/community or just searching Her Money Matters over on Facebook. So what you’ll learn in today’s episode is how this guest’s parent’s way of paying kept her out of the debt trap. You will also learn why a $100 purchase was her best money spent and what that item is, and how she manages her money without balancing the checkbook, and what money lesson her father instilled in her that she is grateful she listened to. Let me share a little bit about Valerie Rind. Valerie Rind is the author of the award winning book, Gold Diggers and Deadbeat Dads: True Stories of Friends, Family and Financial Ruin. During the height from her career as a corporate attorney, Valerie Rind worked for a housing authority to create it’s pilot personal finance program for 500 low income individuals. Under pseudonym, she was a volunteer moderator for the My FICO Community Forum. She writes about personal finance at valerierind.com and contributes to other media outlets, and the sequel to the Gold Diggers and Deadbeat Dads is in progress so make sure to look out for that. So let’s not delay any longer and head over and meet Valerie. 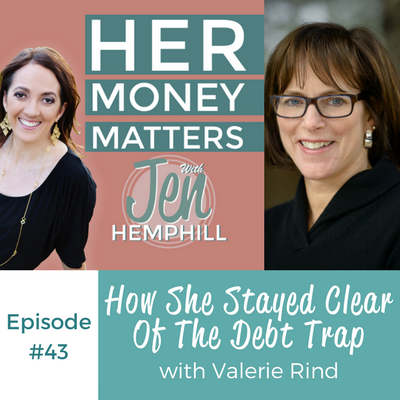 [0:02:40] JH: Welcome Valerie to the Her Money Matters Podcast. I’m really excited to have you here. [0:02:46] VR: Well Jen, it’s great to be here. I’ve been looking forward to speaking with you. [0:02:50] JH: Yes likewise, so are you ready to go ahead and dive into the questions? [0:02:55] VR: I sure am, fire away. [0:02:56] JH: Perfect. Well, I wanted to know, we already know a little bit on your professional side, we know you’re actually a great writer. I’ve seen your stuff and I just have to say just so captivating is one of those things that you can keep on reading, so kudos to that. But I really want to know more about you on the personal side and maybe something that’s unique about you that maybe you haven’t shared before and you’re comfortable sharing. [0:03:25] VR: Okay, well thank you for the nice words about my writing. I sort of have two facets in my life. During the day and evening I’m a corporate attorney and I took a detour from that because I wanted to pursue a career in personal finance for the short term. So I set out and I developed a program for some low income individuals and local housing authority and I just love that. I love getting into something different and making a whole new program. And I did some other things. I was a moderator on the online forum for FICO, people who make the score and eventually, I knew I’d get back to the law which is where I am now, although my practice has absolutely nothing to do with personal finance but it’s in technology, completely different. But in the interim, I wrote a book called Gold Diggers and Deadbeat Dads: True Stories of Friends Family and Financial Ruin, which is how I think we first got connected. I think you saw the book. [0:04:37] JH: Yes. That’s awesome. Tell me how did you get to — why did you want to write that book? What started that all? [0:04:47] VR: It started off because I had a personal experience and I thought, “Look, I can’t be the only person in the planet who’s made some kind of major mistake, right? I figured we’ve all made some mistakes along the way and what I wanted to do was to show other people that they weren’t alone if they had made some sort of mistake with their money and also to keep other people from making mistakes. I found out there were all kinds of people out there making all sorts of problems when they mix their money with their friends and family. So that’s how it came about. [0:05:23] VR: The more, sort of the longer I stick with those, the more people I hear from people contact me through my blog and through email and spill out their stories and it’s very gratifying when they say it’s helped them in some way. [0:05:38] JH: Right, well I can only imagine all the stories that you get. That’s awesome. and now let’s go back when you grew up. Tell us about how you grew up around money? [0:05:50] VR: Well I grew up actually in an upper middle class family but my family had the mindset that you paid cash for things. They didn’t have car loans. So I had no real concept of debt, which I think was a good thing because that kept me out of that trap later of getting into credit card debt. I do remember, my mother taught me how to balance a checkbook when I was in high school. I think that was important to start learning those skills then although I think there should have been more education and school about personal finance in general but that’s a whole other debate we don’t have to tackle tonight, whether it should be the parents or it should be the school. But at least I have some basic start of what personal finance entailed. [0:06:45] JH: Right. Well tell us Valerie, how about what is the best money you’ve spent? [0:06:52] VR: Okay, it’s going to sound funny, but the thing I’m happiest about, the happiest money I have ever spent was on a warming pad for my bed because I am very cold. I live on the East Coast, the worst thing for me is getting into bed in the winter into cold sheets. So I bought this bed warmer. I turn it on and I get into bed and it’s nice and toasty and it wasn’t expensive. I don’t know, maybe it was $100 or something? But I couldn’t live without it in the winter because that makes me happy, it makes me comfortable, it wasn’t expensive, it’s paid for. [0:07:37] JH: Well I like that because like you, I get cold very easily and with the boys here, I’m the only one that gets cold so easily. So I try to keep that in mind, keeping the thermostat so I just end up bringing a sweatshirt or a sweater or something to warm myself up or else they’ll just be too hot or complain to being too hot. So that’s how we plan, especially in the winter time and the floors in the bathroom, oh my goodness yeah, I hear that. So I agree, that can be some good money spent and tell me a little bit about what you’re comfortable with, how do you manage your money? Do you use a spreadsheet? Do you use a software or maybe, are you more traditional in the sense of pencil and paper? [0:08:32] VR: These days and probably for the last few years, I use the program Mint, Mint.com and I don’t get any kind of payment from them for endorsing them. It’s just what I found that works best. I like it because it pulls in all the information for my accounts in one place so I can see what I’ve charged on credit cards and what I’ve spent coming out of my checkbook and what’s going in as a paycheck or book sales and I don’t even have to go anywhere else. I’ll go into my credit card statements just to make sure there aren’t bad, fraudulent charges showing up but I have pretty much centred all of my financial doings in Mint and I have to say I don’t even balance my checkbook anymore. I’m sure my mother would be rolling in her grave somewhere, but first of all, I don’t write that many checks anymore anyway. So it’s such not a big deal. [0:09:37] JH: So basically, it’s just Mint and you concentrate on all your efforts in Mint and how often do you go into Mint? [0:09:46] VR: I go into it, and I also use it for budgeting as well. I’d go into it several times during the day probably because as great as a program it is, you do have to re-categorize things. For example, if I go out to dinner and I have a meal for say $25, it will show restaurant $25. So I have that coded as restaurant but then when the credit card bill comes in, it shows credit card bill $25. So I have already paid the $25 and I don’t want to pay it twice so I’ll have to recode it as “hide from budgets”. So that’s a pain to be re-characterizing stuff and I’m obsessive about having things right anyway. So I’m in there definitely several times a day. [0:10:36] JH: Okay, perfect and I know you mentioned you don’t write checks much anymore. What is your preferred method of payment? I know growing up you’ve heard a lot of paying cash. But do you use — I know you’ve mentioned you use a credit card. So what is your preferred payment, cash, check or credit? [0:10:58] VR: Oh definitely credit. I use credit cards for everything. I pay them off in full. I like it because it’s all in one place. It tracks back to Mint and initially, I started using it for the cash back feature. So I would actually get a small amount credited back each month based on the amount that I had charged. Recently, I just started doing what they call travel hacking, which is using the cards where you get miles depending on your spend and then you can go travel for free. So as I said, I rarely use checks. Cash I actually don’t like because that just goes through my hands and I had no idea what I’ve spent. In fact, I have to remember to put it down in Mint that I actually paid cash for something. I just find it harder to track when I use cash. [0:11:53] JH: Okay, perfect. And would you consider yourself a saver or a spender? [0:12:01] VR: I think I’m actually both. I mean on one hand, I’m a disciplined saver for retirement and goals, but on the other hand I feel really strongly that you have to enjoy life also. You have to allow yourself to do things and sometimes, even to do things a little impulsively but keeping it all in check. So I don’t fall to one extreme or the other or perhaps, I fall in both extremes but I balance it out somehow. [0:12:32] JH: Right, and I know you mentioned — and I agree you have to enjoy life. You mentioned being able to spend impulsively, how do you manage that? Do you budget for those things or tell us a little bit about that? [0:12:48] VR: Well, I can’t say the bed warmer was in my budget specifically. I had an opportunity come up recently that I couldn’t have anticipated, couldn’t really have budgeted for but it was something just truly compelling though. I felt I couldn’t miss out on. It’s something that will just come out of my savings. The savings I had that I had earmarked for emergency savings. Certainly, it’s not going to decimate the account. It will be a blip but it was something I felt strongly enough that it was worth investing in. [0:13:34] JH: Okay perfect. And who would you say influenced you the most in the area of money? [0:13:41] VR: Oh without a question, that was my father. When I was very, very young, he would tell me, “A woman has to have a marketable skill. She can’t rely on a husband to take care of her because the husband could leave her or he could die or they get divorced. So you can’t rely on a man,” and at the time, just like any other advice your parents give you, you basically said, “Yeah, yeah, yeah whatever.” But it turned out that he was absolutely right and I was very glad that he instilled that in me. [0:14:25] JH: That’s beautiful. And what other things, it sounds like he was a great man, what other — did he have any other conversations around money with you? [0:14:36] VR: I think and maybe that’s where I got the spender saver part from that he and my mother as well, didn’t spend a lot of money on cars. Cars were just not something of interest to them. They didn’t have flashy cars and of course, I was unhappy because I didn’t get a nice car to drive around in. I mean where I grew up, kids not only drove around in flashy cars, they owned them. They were given cars for birthdays or whatever. So my parents were not into that, not spending a lot of money, but on the other hand they valued travel. So they would take pretty extensive travel because they thought that was a worthwhile way to spend their money and it might be a much bigger or more expensive trips than other people would take but on the other hand, there weren’t a couple of BMW’s sitting in the garage. [0:15:39] JH: Right, so they prioritized their money spending on travel versus the cars. [0:15:45] VR: Right, pretty much. [0:15:46] JH: Okay, perfect. And now I noticed, I want to ask you if you’re willing to talk about it, I noticed that there is another book in the works? [0:15:55] VR: Right, there is a sequel. I thought, “Okay, I’ll write this book. I’ll be done. I’ll move onto something else,” and I sort of didn’t realize that there was going to be so much coming out of the first book that I would have the opportunity to do wonderful podcast like yours Jen and speak with other people and as I was saying before, people have been reaching out to me. [0:16:38] JH: That is awesome and when about do you think? I mean I know a book takes time. So when is the timeframe that you’re thinking? [0:16:49] VR: Yeah, that’s slated for late 2016. [0:16:52] JH: Okay, that’s exciting. [0:16:54] VR: Yeah, it is. I never dreamed I’d write a second one. I mean the first one was such a pain. If I had known how much work it was going to be, questionable whether I would have done it, because people think you just sit down and write a book and there’s a lot more to it. But it was actually a lot of fun. I like the whole process since I self-published it. I like being the project manager. So I got to pick an editor and I picked the cover designer and I get to pull it all together and that part of it I was surprised that I really liked as well. Picking a team, having the teamwork together and seeing the finished product. It was very exciting. [0:17:35] JH: Right, well I bet with pulling the different stories that you got to put, that’s a lot of work in itself. I can only imagine because you have to fold all these different stories that people gave you and you’re compiling them in the book because that’s what I understood. I have not read the book but I can imagine how much work that is. [0:17:56] VR: Right, the hardest part was at the beginning. It was getting people to talk to me because I would say, “I’m writing this book and so on,” and I was surprised that anybody talked with me at all because it was strangers as well. It wasn’t just people that I knew so I had to solicit total strangers to spill their guts about some very, very personal things. About ways they had totally screwed up the way I had so I was honored really, that they would do so. It’s much easier for me to find people now because I have this book I could point to and say, “Hey, I’ve done this” and I am very, very careful about anonymizing people. I changed all the names, I changed all the places, the professions, sometimes I change the gender people. Like if there’s children involved like a younger boy will become two older sisters or something like that because I’m just very conscientious to protect the identity of the people involved. All of them not just the people who tell me the stories but the people on the other side of the fence because I’m only getting the story from one side. I’m not an investigative journalist so I don’t speak with the other people in the story who might have a different take on the whole thing. I’m only taking it from one side. [0:19:30] JH: That makes sense, that makes sense. That’s awesome. Well Valerie, this has been a treat. So as you know this podcast is all about making money simple and taking control of it, how would you finish this sentence: Her Money Matters because ____. [0:19:58] JH: Okay, perfect. I love that. Well I really, really appreciate you being here Valerie. I will be sure to put those links of your book in the show notes but tell us where is the best place for people to find you and learn more about you? [0:20:15] VR: Okay, my website is Valerierind.com, it’s rind like watermelon. Facebook, I am Valerie Rind, Twitter I’m @valerierind, Google Plus, Valerie Rind, it’s pretty easy. [0:20:31] JH: Everywhere Valerie Rind. [0:20:32] VR: Yeah, I mean everybody knows me as Gold Diggers and Deadbeat Dads but that was too long a URL. I actually do have the domain name but it just defaults back to Valerierind.com. If you can’t remember Valerie Rind, just Google “Gold Diggers and Deadbeat Dads” and I’ll probably come up first hit. [0:20:53] JH: Perfect, awesome. Well I appreciate you sharing all of that and I’ll make sure to have that in the show notes so thanks again Valerie for joining me today and I look forward to connecting with you soon. [0:21:08] VR: All right, it was great to talk with you Jen. [0:21:12] JH: Well that was our interview with Valerie Rind and I hope you enjoyed it as much as I enjoyed chatting with her. One thing that really stood out for me in the interview with her was her parent’s values. You noticed that she mentioned that they valued trips. So they would pay good money for trips over BMW’s or over fancy cars and that’s how they chose to spend their money. I want to make sure that the message is clear here, everyone is different. So if you let’s say chose fancy cars over the trips, that’s okay. That’s your prerogative, that’s your choice and that’s completely okay. Just know what you value and build those financial goals around that, all right? So I want to really quickly give a quick shout out to Julie. She’s one of our Fearless Money Sisterhood members and she’s made some huge progress on getting clear where her money was going because that would be something that she struggled with and she’s been able to make those adjustments to fit her financial needs better. So keep up the great work Julie. It’s been such a pleasure having you in our community. So that is a wrap for today and remember, join us over in the Facebook Group that by searching Her Money Matters or going to Jenhemphill.com/community. I’d love to connect with you outside of the earphones that you have when you’re tuning in listening to this or through your computer when you’re listening or maybe whatever other device you’re listening to this podcast with. So yes, definitely head over to Facebook. I’d love to connect with you and say hello and get to know you. So that is wrap, I want to thank Valerie for joining us, sharing all that she had to share and be sure to check out the show notes and where to find Valerie at and more at Jenhemphill.com/43. That is Jenhemphill.com/43. Thanks again for tuning in and we’ll catch you next Thursday.